Get The Best Residential Roofing Around With Universal Roofing! Universal Roofing is your one stop shop for your residential roofing needs! We have a team of fully licensed and insured contractors who can help you with your upcoming roofing project! We set high standards for our contracting team, and ensure that your new or repaired roof will exceed any expectations that you have! We pride ourselves on you being able to have a perfect new roof that will last for years to come! We work on storm-damaged homes and business properties, both residential and commercial throughout the greater Omaha area. Our team has designed and installed thousands of roofs in the state of Nebraska. We are a locally owned and operated company, and all of our workers and managers live right here! If you need referrals from satisfied customers in your neighborhood, just give us a call. We are committed to your best interests by delivering exceptional care to your insurance claims, expert installation, and using only top building products available in Omaha metro and surrounding areas. Purchasing a new roof is one of the most important investments you can make for your home. Along with selecting the right roofing products, it's extremely important to find the right professional roofing contractor. When making this investment, it's crucial that you receive trustworthy support and the expertise needed to complete the work. At Universal Roofing, we take the time to carefully analyze your home, property, and location to ensure we recommend the best materials and services to meet your needs. 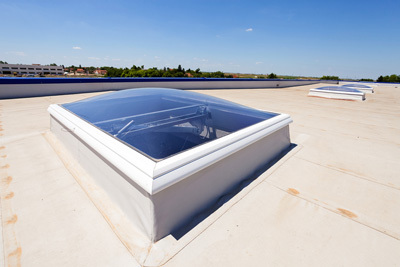 Our commercial division provides efficient and quality installation of all commercial roofing systems - including roof coating for flat roofs - on new roofs; re-roof applications and repair or replacement solutions. Whether you're in need of small repairs or the complete construction of a new roof, we can design a system specific to your unique needs that can be both cost effective and energy efficient. We have partnered with manufacturers who are on the cutting edge of design and product development, and who are committed to lasting quality and performance. 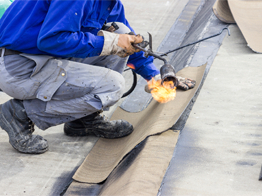 This ensures a wide selection of tile, foam, and flat roofing products for commercial and industrial projects. You will be buying more than just a roof from us; you will be buying peace of mind, knowing we will be there to service or repair your roof when you need it. Please call us today to discuss your building's industrial roofing needs. We're experienced roofing specialists, providing the highest quality roofs with exceptional customer service and we are here to help you! "Thank you for doing such a great job on our roof. After the hail damage, we wanted to make sure we used a reputable local company and after meeting with Nick and checking your references, we made the decision to go with you. Universal Roofing made the process simple for us. They worked with our insurance company on our claim and scheduled and completed the roof replacement in a timely manner. We will definitely recommend your company to anyone who asks for a trustworthy roofing company." "We had Universal Roofing replace our roof last month and were very happy with the new roof and found their crew very efficient. The roof looks great and they did a wonderful job cleaning everything before they left." If you need residential roofing services for your home or business in the Fort Calhoun area - our team is standing by to offer you a FREE estimate! Contact us for the best roofing solutions and quality service every time. We had hail damage from a big storm that hit Omaha, NE. We called Universal Roofing and they came out very quickly, they are so friendly and knowledgeable, and we were also very pleased with the work they did! The contents of this webpage are Copyright © 2019 Universal Roofing. All Rights Reserved.